PUSH Kiting is a Kite Sports School based in Clacton on Sea, Essex. It is the leading Kitesurfing school on the East coast of Essex near London, offering the highest quality Kitesurfing lessons, Kite Buggying lessons, Land Kiteboarding lessons, and Power kiting lessons on a daily basis. Push Kiting to make kite boarding tuition easy, safe and fun, providing lessons that are of the highest quality, made possible by utilizing only the top professional instructors and the highest quality equipment. Push Kiting offer a wide range of kite sports lessons and activities, for all skill levels and all ages. Kitesurfing lessons taught by BKSA Qualified Instructors, with prices including hire of all equipment. BKSA qualification once trained. Professional Kitesurfing lessons for all levels, whether beginner or expert available as private tuition or group bookings. 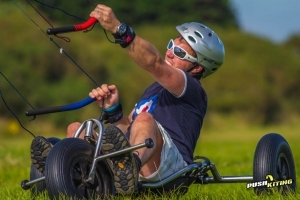 Experience the thrill of kite buggying, a fantastic group activity perfect for an adventure day out, work outing, or a stag/hen do. Learn to control a powerful kite with ease, and start to build the skills you need to master the kite as well as a landboard in unison. As seen on BBC's CountryFile, our kite landboarding has spanned the globe. Perfect for an adrenaline boost without getting wet! Land Kiteboarding lessons are available all year round, and are taught by the Globally recognised PUSH Kiting Professional Landboard Team. Power Kite lessons are not only a great deal of fun, but also an ideal entry point into all of the power kite sports. Our Power Kite lessons will teach you the kite skills needed to progress quickly in any of the kite sports, ideal in a great range of wind conditions. 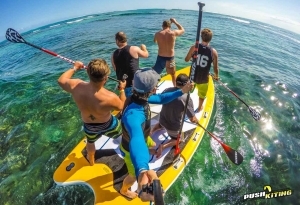 Our BSUPA, British Stand Up Paddle Association Qualified instructors are here to show you the skills needed to enjoy this hugely popular sport. Enjoy a stand up paddle board lesson whether you’re a complete beginner or a seasoned pro, whether you are a child or a grandad! PUSH Kiting offer a range of video and photography services that are bespoke and completely unique. Looking for a spectacular aerial shot for your website or print materials? Or perhaps you need action shots for a movie production? We’ve got you covered. 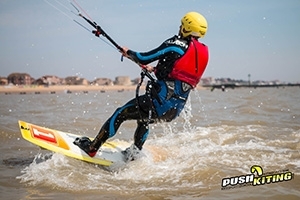 Push Kiting is one of the most respected and trusted names in the Kite Sports arena, based in Clacton on Sea, Essex. Our founder and head instructor David Ursell has been kiting since 1996 and has a huge amount of kiting experience, racking up over 8000 hours of kite teaching experience. David is a BKSA Senior Instructor and now also the only Advanced power kite Coach in the UK, who is professionally sponsored by North Kiteboarding. 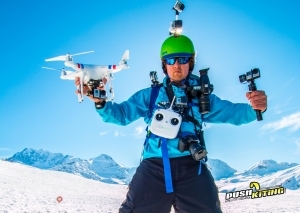 The Push Kiting name is synonymous with professional kiteboarding and we’ve been filmed by numerous broadcasters including Discovery Channel 3D, by BBC Countryfile, Blackberry, BBC leisure programs, BBC News, Devin Super Tramp, and the list goes on. We also feature in Kiting media such as PowerKite magazine, Kitesurf Mag, Kiteworld and kite forums etc. 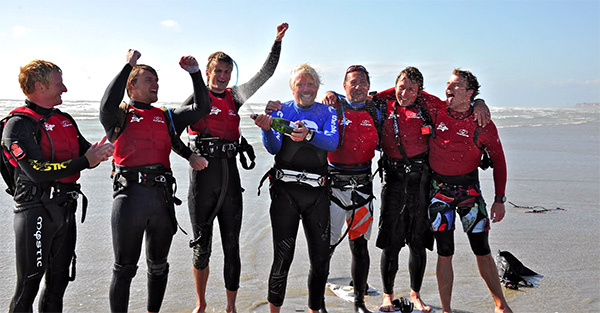 David successfully guided Richard Branson’s world record as the oldest person to kitesurf from England to France. Push Kiting has been making kite videos for over 20 years! racking up millions of views we still love pushing our kiting to new levels and catching the antics on film for the community to enjoy and hopefully inspire others to start kiting. Enjoy our videos and share the fun with your friends! Here are just a few of the wonderful things people have said concerning our Kite Sports services. Thank you Dave, Henry had an amazing introduction to Kite Boarding and Kite Buggying. He picked up the kiting techniques very quickly with thanks to your expert tuition. See you in the summer! Had a fantastic time kite bugging with Dave. He was very patient and a great teacher. Would recommend anyone to have a go. I bought my husband a kite and buggy but we couldn’t get hang of it so booked a lesson with Dave. It was money well spent. Dave is an amazingly patient, knowledgeable and skilled teacher. We learnt so much and can now really enjoy the sport. We wouldn’t hesitate having further lessons to progress further. Thank you Dave, we are having so much fun with the buggy now. Had a fantastic lesson of land based kiting learning about kite control. Very friendly tuition, came away with my neck and back aching so job well done! If your thinking of starting up – choose PUSH. Their experience is second to none. Had an awesome 4 hour session this morning getting to grips with the landboarding. Couldn’t of enjoyed it more, aswell as the instructor Dan being bang on the Money with all his advice! Nice one guy’s many thanks! See you in a few months for the kitesurfing I reckon! I had a couple of days training with Danny and dave they are really great guys. had lots of fun whilst learning. look forward to doing more lessons and days kitesurfing with them. Just a few more reasons why Push Kiting are the number one choice for Kite Sports in Essex. Fully Registered BKSA (British kitesurfing association) Kitesurfing school. All the latest kite stock – We use only the latest premium Duotone Kiteboarding kites, if you’ve seen kitesurfing, you’ve seen Duotone kiteboarding equipment. David is proud to be a Duotone Team Rider. Duotone, which until 2018 was named North Kiteboarding has continued to dominate the Kitesurfing market by producing superior products across the board, leading the way with high performance and easy to use kites, boards and apparel with a level of care and detail unsurpassed in the kitesurfing world! Worldwide recognized school – We have students fly in for lessons with us from China, Japan, USA, Germany, France, Holland to name just a few. – by Discovery Channel 3D and is the main feature for one episode of “High Octane” extreme sports series. – by BBC Home away from Home kite buggying & BBC Countryfile, Teaching the presenters Matt Baker and Julia Bradbury how to kiteboard. – by Blackberry for their European “Blackberry Torch” TV adverts in 2011. PUSH Kiting also feature in Kiting media such as PowerKite magazine, Kitesurf Mag, Kiteworld etc.